Clan-Gifts.com - Scottish Clan Names - Clan Fraser Store! The name Fraser originated in Anjou in France (originally de Frisselle, de Freselière or de Fresel). They settled first in Tweedale and Lothian, the name becoming Fraissier (strawberry bearer) with the flower of the fraisse or strawberry as part of their armorial bearings. The earliest record of the name in Scotland is Sir Simon Frasee (sic) who held lands of Keith in East Lothian. A later member of the family was Sir Simon, "The Scottish Patriot" who was a supporter of William Wallace and defeated an English army at Roslin. Later, Sir Alexander Fraser married the sister of King Robert the Bruce and another Fraser founded the town of Fraserburgh. In 1375, a marriage to the daughter of the earl of Ross gave them lands in Buchan which became the main seat of the family. The Lovat Frasers appear in the 15th century around Beauly. In 1544 the Lovat Frasers fought the "Battle of the Shirts" on the shores of Loch Lochy against the MacDonalds of Moidart - only five Frasers and eight MacDonalds survived. Simon, the 11th Lord Lovat, was executed at Tower Hill in London in 1747 after participating in the Jacobite Uprising. In 1757 the 12th Lord Lovat raised 1,800 Frasers Highlanders for military service in America. Simon Christopher the 15th Lord Lovat served in the Scots Guards and was an outstanding Commando leader in World War II. Fraser is the 23rd most common name in Scotland - but is one of the 6th most common around Inverness. The motto of the clan is "All my hope is god". Septs (sub-branches) of the Frasers include Bissett / Mackim / Simon / Brewster / Mackimmie / Simpson / Cowie / Macsimon / Sims / Frew / Mactavish / Syme / Frizell / Oliver / Twaddle Macgruer / Sim / Tweedie. 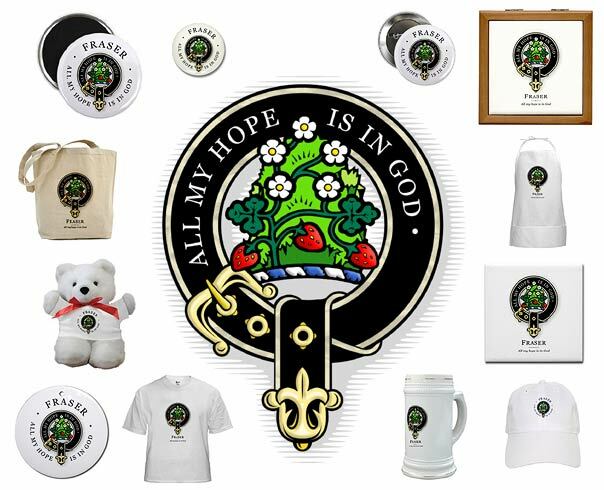 At Clan-Gifts.com we offer a wide range of quality Scottish gift Items, souvenirs, apparel and housewares, all printed with a beautiful rendition of your authentic Clan Fraser crest! Our Clan Fraser gift store stocks over 70 products*, and all items are fully guaranteed! Our great prices, low shipping costs and excellent customer support make us an excellent choice for Scottish Clan Fraser merchandise!